Jon Stewart has been flirting with me, and I’m not really sure how to handle the whole situation. I mean, I love him, but, you know, not that way. I mean I could love him that way under the right circumstances, like if my husband told me he was hiking the Appalachian Trail, and it turned out he was really shacking up with Jon Stewart’s wife in Argentina. But that would never happen. Probably. I’m pretty sure. Because my husband would rather walk a golf course than hike a trail, and I would be kind of suspicious if he said he was playing golf and he didn’t come back for a few days. Mostly because he can’t last more than 3 hours on a course without deciding that he completely despises the game and should never play again. But back to the Stewart thing, you are probably wondering how I know about his not-so-secret crush. My answer is, “Well, women just know these things.” And that is true. We are amazingly attuned to men who are attracted to us. I totally knew, for example, when my dry-cleaner had a crush on me, even though it took him 18 months to inform me of this. And with him, there were really only two clues: 1.) he always had my form filled out before I even walked in the door, and Dos.) he kept giving me random discounts when no one else was there. My two clues with Jon Stewart are: 1.) his recent hysterical interview with David Sedaris, who just happens to be my favorite author, and whose book I had just ordered on Amazon the same exact day he appeared on the Daily Show, and Dos.) his completely random attack on my sworn enemy, Donald Trump, who would completely justify someone’s use of “toupee-dar“. I mean, for those two events to happen on his show within the span of one week is just way too much of a coincidence. And then he announced that John Oliver will begin guest hosting on June 10th, and that just makes everything as clear as the unflavored Knox gelatin mixed with warm water that I paint on my daughter’s hair when she has to do a synchronized swimming performance. Because June 10th is exactly when my vacation starts. And if Jon Stewart is not going to be hosting his show, just where exactly do you think he is going to be? I used to look that good. Before my 5-year-old started school. It’s been almost 24 hours, and I am still mad at JLo. You will probably argue that I should not be upset with her. But then I’ll just be mad at you, too. My daughter was assigned a landform, archipelago. She informed me a couple of weeks ago that she needed to make her landform out of salt dough on cardboard and paint it. I will not get into the ins and outs of why this “project” did not get done until the night before it was due. I’ll grant JLo this; it wasn’t her fault that my daughter started it late. So, last night my daughter started painting her archipelago before synchronized swimming practice, then pulled out a paper that detailed the other part of the project about which she had neglected to inform me. At 8:40 PM, after synchro practice and dropping off our carpooler, my daughter finally started Part II. This included researching, folding, decorating, labeling, and finding the square root of Pi. She is now the world’s Greatest Expert on Archipelagoes. We will be putting that on her college application, I am sure. At 9:40 PM, our golden retriever came indoors with poop all over one foot, and managed to smear it all around our living room archipelago of furniture before my husband realized it. He cleaned up the concrete floor. I got the job of getting the poop off her foot. At 10 PM, our daughter informed me that the printer would not print out the non-mandatory picture that she had decided to add to her masterpiece. At 10:20 PM, I was watching Jon Stewart, who was interviewing JLo. “You have twins, don’t you? How old are they now?” he asked. “They’re about to turn 5,” JLo said, proudly. AND THE AUDIENCE CLAPPED AND HOOTED ENTHUSIASTICALLY. For JLo. Because she has kids. And they are about to turn 5. Yeah, JLo. You rock. What a great mom you are. For keeping your kids alive to the age of 5. Have you had to work a long day, come home, fix dinner, ride herd on your child to finish her project (even though you agree with her that it is a complete waste of time), drive carpool, ride herd some more, clean a poopy dog foot, and shove your bulldog to one side just so you can fall into an armchair to rest at 10:05 as your daughter glares at you for not fixing a printer or reading to her before she goes to bed? I think not. And, I don’t think you ever will. That is why I am mad at JLo. Because it’s completely pointless to be mad at the half-witted audience who applauded her just for being a pop star with two almost-5-year-olds. Plus, she was a little bit too flirty with Jon Stewart. You can only push me so far. And then I arrived at my Early Voting Location, and the line was 50 people out the door in the hot sun and there was clearly no parking available, so I just continued driving. So, now, people will say that I was an irresponsible, non-voting citizen consumed by thoughts of Donald’s Trump’s ridiculous mop of a mane. And Jon Stewart. Let’s make that clear. If you are looking for trends in my posts, I mention Jon Stewart a heckuva lot more than Trump. 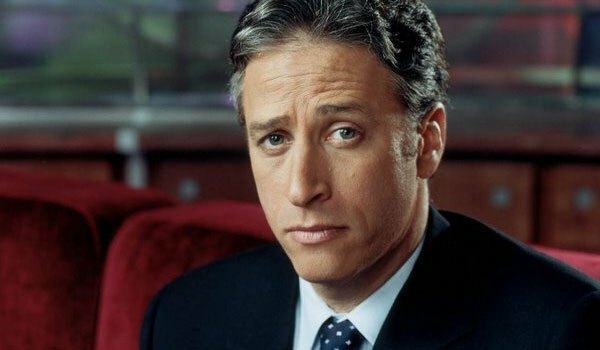 So, allow me to spell it out for you, Future Biographer of Mrs. Cap’n Firepants: I loved Jon Stewart, hated Donald Trump’s hair, was somewhat doubtful about John Mayer as a person (but liked his music), and made a half-hearted attempt to vote even though she suspected her husband’s vote was going to cancel hers out. (The last item may change to “she braved Heck and High Water to make an ill-fated stand” if I find a way to vote on the actual Election Day.) Oh, and I never heard of this musician named “Shooter”. See? 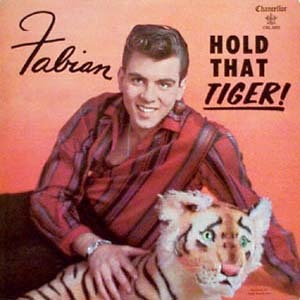 There’s nothing to analyze here. No secrets or hidden agendas. I’m just plain ole Mrs. Cap’n Firepants, who just happens to have random thoughts about Donald Trump’s hair on a semi-regular basis. On most nights, the routine goes like this: read to Dimples, check a few e-mails, then travel down the long hall to the living room for my daily dose of The Daily Show. As soon as I cross over from the Forbidden Section, Wonderbutt (who is usually forlornly sprawled as close to the border as possible) perks up and follows me to the living room. I settle myself into our big old leather chair, and Wonderbutt places himself on the floor directly in front of me, and whimpers a couple of times. When he first started this, I thought he was angling for an invitation to join me on the chair. (Which is silly, because it’s the one piece of furniture on which he has always been allowed.) Under this erroneous assumption, I would pat the space beside me several times. Eventually, he would leap up, and make himself comfortable, sometimes resting his head in my lap, but oftentimes stretching out on his stomach and kicking me squarely in the crotch. Fortunately, I am female, so crotch kicks are not quite detrimental to my health. Also, fortunately, like Wonderbutt, the chair is oversized. With a little manipulation, we both fit on it quite well. In a matter of minutes, I am turning up the television so I can hear Jon Stewart over Wonderbutt’s snores. 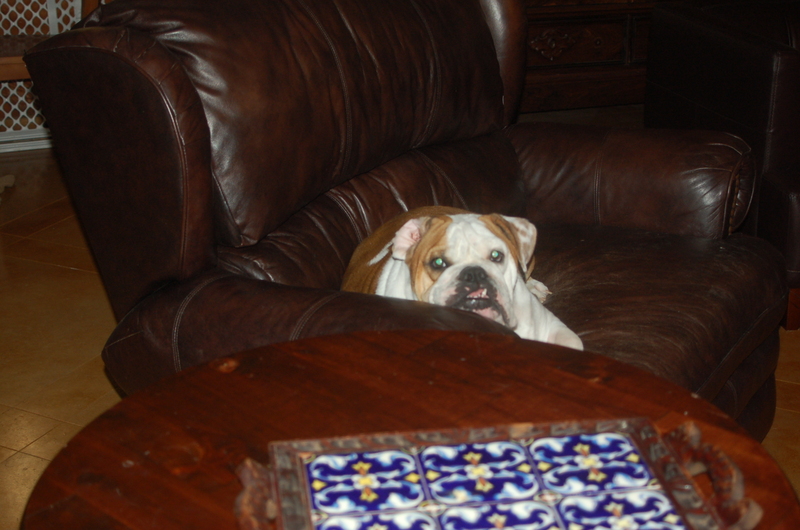 One day, I realized that he only demands an invitation when I am on the side of the chair closest to the end table. (Wonderbutt, not Jon Stewart. Jon Stewart is invited to share the chair any time he chooses.) If I am on the other side of the chair, the dog hops right up with no hesitation. I tested out this theory and, sure enough, right side – whimper, left side – immediate leap. So, it seemed that the whimper was not a “Please, may I sit with you?” request, but a “Get the Heck off my side of the chair” rebuke. Being the troublemaker that I am, I decided that, from now on, I would always sit on the right side. I needed to prove who is boss, after all. Last night, I finished reading to Dimples and wandered out to the living room, fully prepared to engage in the nightly ritual of “allowing” Wonderbutt to settle on the less desirable side of the chair. And, there was Wonderbutt, already fully esconced on the chair. Pretty much taking up the entire space, but quite obviously occupying the right side, his declared favorite, with no room for me. His head leaning on the arm rest, and his tongue sticking out in what I’m pretty sure was an “F you” expression when combined with the look in his eyes. Wonderbutt has no doubt about who’s the boss. It appears that I underestimated my opponent. Again. It might appear that he is snarling, but that is just a combination of his sleepy look and his underbite. I think. Sign up Now for Your Trip to Nantucket! In fact, I’ve gained 10 pounds, which is somewhat distressing. It’s not for lack of effort, I must point out. I mean, I did a three day pledge drive – which resulted in the least number of new subscribers daily that I’ve ever received. 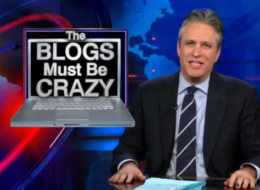 I mention Jon Stewart every moment I can, barely avoiding being labeled a stalker. And I think I would have gotten the million dollar advance if The Bloggess had not beaten me to a publishing contract by a couple of years. I can’t really explain the 10 pounds, but I’m just going to blame it on my “inefficient colon”. Obviously, everything I eat is being immediately converted to fat instead of, uh, doing what it’s supposed to do. Now, I always tell my students that the most important part of achieving their dreams is perseverance, so I would be a hypocrite if I gave up on everything now. That is what normal, easily discouraged people, would do. So, I am going to stick to my mantra, which is, “Do what you want to do or prove that it can’t be done by killing everyone in your way yourself trying to do it.” You are welcome to borrow that quote if you like. Plus, it’s a bucket list. Which, I am assuming means that I have until the point that I kick the bucket to finish it up. I have to check the official rules of bucket lists, but I think that, if you start going in the opposite direction of the items on your list, that means you hold off death a bit longer. But, you can’t make that your goal, because then you have really changed your bucket list, and you will just speed things up. I know. That last one is a bit unrealistic. But I’m thinking of removing the inefficient colon, by force, if necessary, and surely it weighs at least a pound. Oh, and I’m not calling it a bucket list anymore. 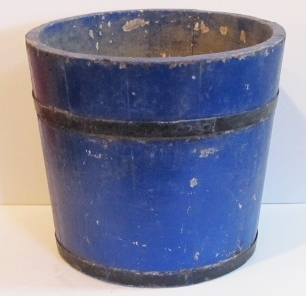 There is pretty much not one thing that I find motivating about buckets, much less kicking the bucket. So, it is now my Nantucket List. As soon as I get it all done, I will give myself a relaxing trip to Nantucket. And, what the heck, my heart is just as big as Oprah’s, I’ll take my 2 billion subscribers with me. Is it Possible to be a Socialist Socialite? Anyway, I want to thank Jon Stewart for pointing out my economic (and possibly philotherianistic) beliefs. I think he’s really the only person who understands me. Now, I should probably clarify; Jon Stewart did not announce, “Mrs. Cap’n Firepants – you, my dear lady, are a Socialist.” That would have been totally cool, though. To have Jon Stewart talk to me directly, I mean – not the labeling part. No, I inferred that I am a Socialist from his amusing attempt to define Socialism using the language of other people who seem to like to bandy that term about. (I’ve always wanted to use the word “bandy” but no one in my family seems to really like to bandy things because they are far too thoughtful and deliberate, so it’s never actually applied to anything in my life.) As I was laughing at how funny it is that the same people who call everyone else Socialists, by their own definition, are Socialists, I turned the spotlight on myself for a moment (because everything is about me), and realized that even though I have not once, not ever called anyone a Socialist, I am one. It was like some major epiphany right in the middle of The Daily Show. I don’t know if Jon Stewart fully realizes the power he possesses. You see, we throw this fair at our school once a year, and the teachers are expected to work the booths. The first few years, I noticed that a couple of the grade levels not only had the cushiest jobs (like selling donated cans of soda – as opposed to sitting in the dunking booth), but they also made the most money to spend on desired curriculum materials. When I suggested rotating the jobs, no one could agree on a fair way to do this. Then I said, “Why don’t we just split the money evenly after each fair?” there was a lot of grumbling. But we did it. And it seemed to work. Anyway, my point is, I am a Socialist. Just by nature of participating in and supporting the public school system, I am a Socialist. I think. So, I would like to thank Jon Stewart for helping me to come this realization. And I would like to apologize to everyone I have offended with my Socialistic form of bullying. I shall work on rectifying this matter as soon as I start making enough money to not care anymore. Just put my face in there. Oh, right. You don't know what I look like. This is my 84th post, and I still have not been invited to spend a week with the writers of The Daily Show or The Colbert Report. I think I’ve figured out the problem, though. I haven’t really been hitting the politics too hard on this blog. Partly because I don’t want to offend any of my readers. And partly because I don’t really know anything. But I’m going to take a risk today, and pretend that really doesn’t matter. All of the bipartisan bickering lately (for the last 8 years, interestingly enough – since that is how old my daughter is) is driving me crazy. So I would like to propose a new solution. This may involve a complete overhaul of one of the Schoolhouse Rock Videos, but I’m pretty sure you will agree that it’s worth it. Use a random name generator, such as the Secret Agent or Lady Gaga ones, to give all of the politicians code names. Only the President will have a complete list, and it will be kept in the White House in a safe that requires two people to open it at the same time. I would suggest that the keys be given to Conan O’Brien and Jay Leno, as they would cooperate with each other only under the direst of circumstances. Politicians will consult the Siri goddess on their iPhones, and then submit any proposals for law changes to a shared Google Doc, using their newly selected random names as their Gmail addresses. Their political parties will not be revealed. An objective citizen, such as Ryan Seacrest, will categorize the possible laws and blog about them anonymously, grouping similar but opposing views in the same posts – still without identifying the sponsoring political parties. Citizens and non-citizens will be invited to read and comment. Vile words and incomprehensible texting abbreviations will be thrown out by the moderator (Seacrest again). WTF will be allowed, as it is the only way to express complete astonishment at the idiocy of the Common Man. After an appropriate length of time for discussion on each topic, a survey from PollDaddy will be placed on the blog. Any politician who leaks their code name or a law they proposed will have to appear on a reality show produced by Mark Burnet and their proposal will immediately be disqualified and sold on eBay. The proposal with the most votes on Poll Daddy (with which no political party has been affiliated) will become a law. Simon Cowell (after he applies for, pays a lot of money for, and is granted U.S. citizenship) will be the tie-breaker judge. Charlie Sheen will announce the “winner” late at night on his webcam, and Ashton Kutcher will tweet it to everyone to make sure the maximum number of people know what the new law is. There is no number 10, but stopping at number nine looked wrong for some reason. I know. I should run for President.